Nintendo won’t release the anticipated Switch console until next year, but it may still end up with the hottest new hardware this holiday season afterall. 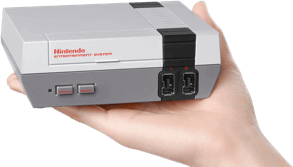 Above: NES Classic Edition is just a wee little guy. The NES Classic Edition, a miniaturized version of the classic 8-bit Nintendo Entertainment System that comes with 30 built-in games, launched today at retailers around the United States. You can buy one for $60, which would save you a lot of money over attempting to buy the system and the cartridges off the second-hand market. But the problem is that the Classic is selling out as fast its going up for purchase. The device has hit Target, Best Buy, Amazon, and more — and at this point it is nearly impossible to find … unless you want to spend hundreds or even thousands of dollars to get one on eBay. It’s unlikely that this drought will last long. Nintendo likely had a smaller launch shipment to ensure a taut supply line (to save cash on warehouse costs) and to create buzz by convincing reporters like myself that this is something worth writing about. But the publisher has also confirmed that it’ll have more systems hitting retailers through the next few weeks and into the holidays. If you want to see if a store near you still has one, you should check this site to see a list of participating retailers. Then get on the horn and start calling around. In the meantime, I’m gonna get my nerf gun and sit on my porch and wait until Best Buy delivers the one I ordered at 1 a.m. this morning. That’s my retro nostalgia, and you better keep your filthy fingers away from it!